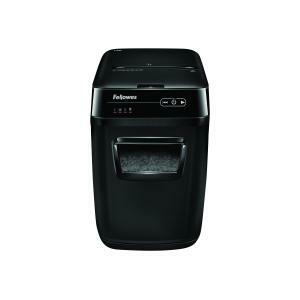 The Fellowes AutoMax 130C Cross-Cut Shredder, with proprietary AccuFeed Technology, provides fast automatic shredding. Instead of manually feeding the shredder, common stacks of paper are easily loaded into the paper tray and up to 130 sheets can be securely shredded with the push of a button. The 130C also easily shreds up to 8 sheets of paper manually, as well as credit cards through the manual feed slot. The AutoMax line offers time-saving innovation to meet the needs of any size shredding job. Simply load the drawer, push the button and walk away with confidence.